At the SAMS Europe we witnessed an interesting case study by subsea engineering, construction and services company Subsea 7 about software audit processes in the oil and gas industry. 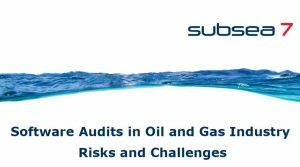 The presentation outlines the reasons why software audits have been accumulating in the past 18 months and shows examples of real audits that took place within Subsea 7. Microsoft, Oracle, VMWare and Autodesk have been moving up to Subsea 7 in order to examine the current software license position. Software audits incoming: what can you do about it? Conclusion: who can manage the software audit process? How to cope with increasing software audits? Have a look at the presentation and benefit from Subsea 7’s experience.